And now to the third and final installment of our favorite songs from Ice Cream Man Wayne Lundquist Ford's superduper Summer 2018 compilation, Songs We Learnt At Sundae School. So popular has this comp been that it has twice reached its quota for free downloads and been rescued by Futureman Records. You can of course pay for the whole LP or individual songs if you like, but if you want the free download, you will need to download all 163 numbers at once and then sort them out according to your own particular impeccable preferences. Many thanks to Wayne Lundquist Ford, Futureman Records, and the contributing artists. Previous posts in this and previous summers' comps can be found here. 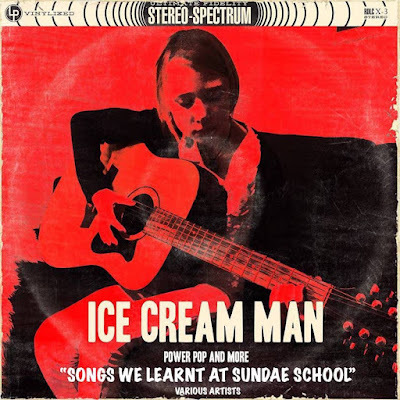 Below is the second installment of songs we particularly liked in the recent monster (nice monster, fab monster) compilation by Ice Cream Man Wayne Lundquist Ford, Songs We Learnt At Sundae School. (See background information here in Installment 1). Once again we're putting the FREELY DOWNLOADABLE full comp first, followed by our favorite songs. If you want to do the FREE DOWNLOAD of a particular song, click the songtitle to go to its download page at Bandcamp. Happy listening and grabbing and stuff. Once again, and OF COURSE, thanks, Wayne!!! If, by the way, you find the compilation and songs are no longer available for free download at any of the links provided. you should still be able to do a free download courtesy of Futureman Records. Pause to cool down (or up).